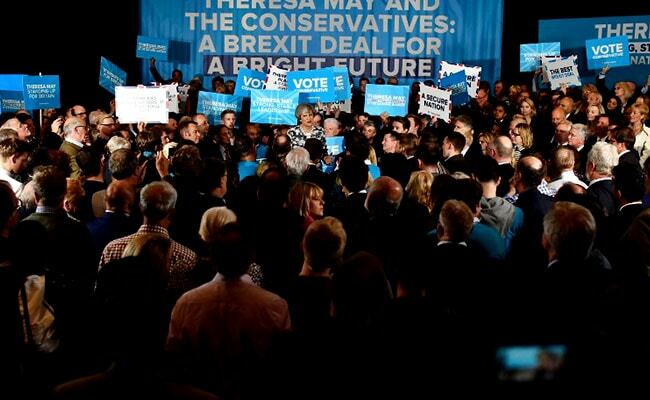 The outcome - an astonishing turn following a campaign that began with predictions that May would win in a historic landslide - immediately raised questions even among her fellow Tories about whether she could maintain her hold on 10 Downing Street. British Prime Minister Theresa May's bet that she could strengthen her grip on power by calling an early election backfired spectacularly on Friday, with her Conservative Party on the verge of losing its parliamentary majority and May facing calls to resign. It also threw into disarray the country's plans for leaving the European Union, threatening to render Britain rudderless just days before talks were to begin with European leaders over the terms of the nation's exit. As of 5 a.m., a projection based on a combination of exit polls and official results put the Conservatives at 318 seats - eight short of what they would need for a working majority in the 650-member Parliament and well down from the 331 they won just two years ago. The Labour Party was forecast to win 262 seats - an unexpected gain of dozens of seats under far-left leader Jeremy Corbyn. The outcome gave him at least a chance, albeit a remote one, of becoming prime minister - something virtually no one had thought possible before Thursday's vote. The results mark the second time in as many years that the British body politic has defied predictions, scrambled the country's direction and bucked the will of a prime minister who had gambled by calling a vote when none had been required. But unlike last year's E.U. referendum - which delivered a clear if close verdict to get out of the bloc - the will of the voters who cast ballots on Thursday was not nearly as easy to decipher. There was little doubt that the Conservatives would emerge, again, as the largest party. But as Labour unexpectedly picked off seats - especially in areas of London that had voted last year to remain in the EU - May's once-undisputed political authority was being called into question. A triumphant Corbyn, crowing that the country had "had enough of austerity politics," demanded that she resign. UK election result: Opposition leader Jeremy Corbyn asks PM Theresa May to exit after Conservative Party's poor show. "The prime minister called the election because she wanted a mandate," Corbyn said in an early morning speech after winning reelection to his north London district. "Well, the mandate she's got is lost Conservative seats, lost votes, lost support and lost confidence. I would have thought that is enough for her to go, actually." Minutes later, May - her voice trembling - delivered her own speech in which she said that as long as the Conservatives remain the largest party, they should be allowed to govern. "The country needs a period of stability," she said. But it was not a given that May would be allowed to stay on. Within her own party, Thursday's results represented a catastrophic outcome that may prompt a search for a new leader - even if the Tories ultimately have the votes necessary to continue to govern. "It was a dreadful campaign - and that's me being generous," Anna Soubry, a Tory member of Parliament who narrowly won reelection, told the BBC. Asked whether May should resign, Soubry replied: "It's bad. She's in a very difficult place." Other top Tories were declining to appear on television to discuss May's fate amid internal party discussions over whether Foreign Secretary Boris Johnson or another senior figure should be brought in to replace her, BBC anchors reported as dawnc broke on Friday. The election results suggested no party is likely to win a majority - a scenario known as a hung parliament. 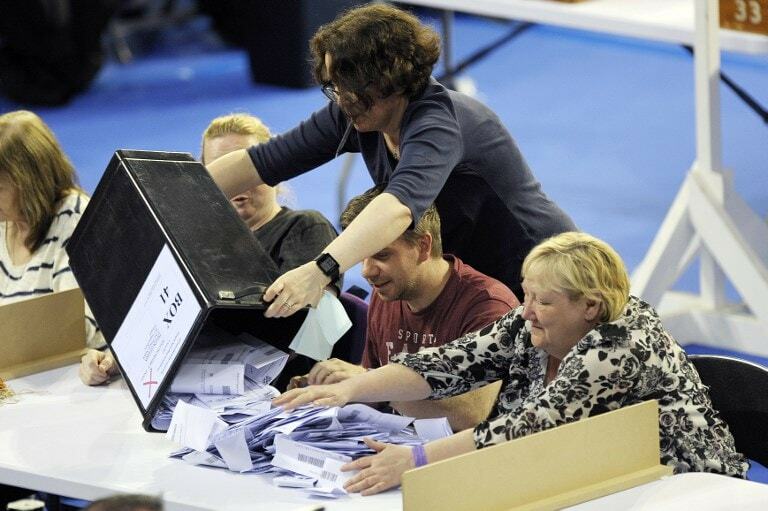 UK election result: Staff members empty a ballot box at main Glasgow counting centre in Scotland, on June 8. If the Conservatives fall short of 236 seats, it will set off a free-for-all, with both Labour and the Tories seeking to forge alliances that get them to the magic number for a majority. It is far from clear which parties would team up, or under what arrangements, to try to govern. A "progressive alliance" - including Labour, the Liberal Democrats, Scottish and Welsh nationalists, and others - may have as many seats as the Conservatives. But the Conservatives would also have potential coalition partners if they fall short of a majority, including Unionists in Northern Ireland. The results - and the turmoil they portend - prompted an immediate drop in the pound, which fell 2 percent against the dollar within minutes after exit polls were released following the end of voting Thursday night. Tories were incredulous at the early numbers, saying that they thought the results had undersold the party's performance and that official tallies would give them a higher total. But as the results rolled in, they grew more somber and acknowledged suffering losses that virtually no one had foreseen. In Europe, observers were bracing for yet more instability out of Britain. The results drew intense scrutiny to May's choice to gamble by going back on repeated promises not to call an election before the one that had been due in 2020. In April, with her popularly spiking and the country seeming to rally around her vow to be a "bloody difficult woman" in talks with European leaders, May stunned Britain with her call for a snap vote that she believed would give her a stronger mandate before the negotiations began. Observers hailed the move as a cunning bit of political strategy and predicted she would secure the sort of overwhelming parliamentary majority that predecessors Margaret Thatcher and Tony Blair had enjoyed. But after that, little went according to plan. 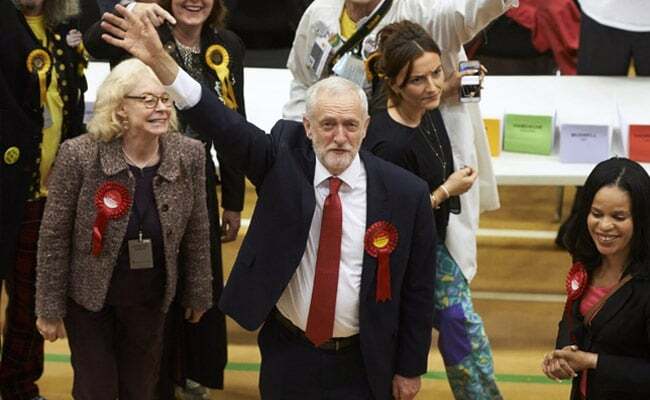 Thursday's vote follows a turbulent campaign that was interrupted by two mass-casualty terrorist attacks, and that was marked by a faltering performance by May even as Corbyn exceeded expectations. 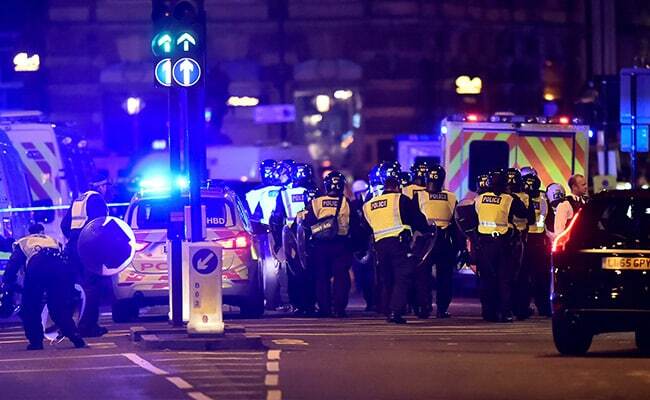 UK election result: Campaigning was suspended after London attack killed 8 people and injured 48. May - known for her resolute and no-nonsense persona - claimed the nation's top job only last year, emerging from the political wreckage of the country's choice to leave the EU. Since then she has had only a slender majority in Parliament - won in a 2015 election when the country was governed by her predecessor, David Cameron - and she had feared that without a bigger cushion she would lack the latitude she needs in steering the country to Brexit. But the approval May enjoyed in office didn't translate to the campaign trail. A politician who endlessly touted herself as a "strong and stable" finished the race being tagged by critics as "weak and wobbly" after high-profile U-turns, including a particularly disastrous bid to force senior citizens to pay more for social care - a measure derisively dubbed "the dementia tax." She also ducked debates, and rarely mingled with voters in unscripted moments. UK election result: Theresa May endlessly touted herself as a "strong and stable" leader on the campaign trail. Corbyn - for decades a backbencher who unexpectedly vaulted to the party's leadership in 2015 with his Bernie Sanders-style message of taking on the 1 percent - faced a steeply uphill challenge to sell himself as a potential prime minister. 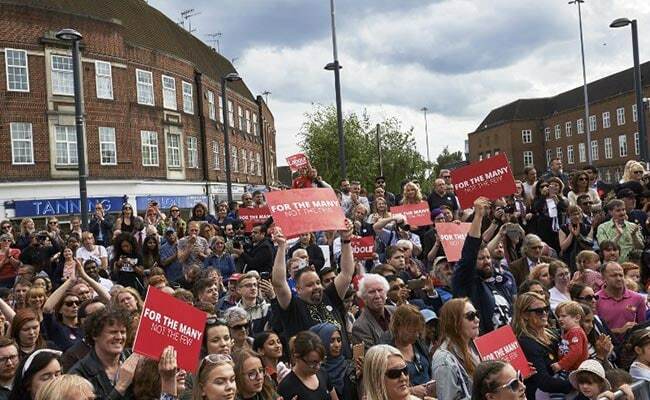 But he was widely seen to have mounted a far more credible challenge than many thought possible, running a nothing-to-lose campaign focused on ending seven years of Tory austerity policies and shrinking the gap between rich and poor. Even if he doesn't prevail, his performance has undoubtedly saved his job as Labour leader - a stinging blow for more-centrist party figures who had quietly hoped the harsh glare of a national campaign would leave him exposed and force him to step aside. Deep into Friday morning, Labour lawmakers who had spent nearly two years trying to overthrow Corbyn lined up to appear on television and sing his praises. The results are a vindication of Corbyn's decision to focus the campaign on Tory budget cuts, rather than allow it to be defined by Brexit. May had wanted the vote to be a referendum on her Brexit plan. But Corbyn spent little time discussing the issue. Like the prime minister, Corbyn halfheartedly favored a vote to "remain" in the EU during the Brexit referendum. But also like May, he promised not to obstruct the will of voters and to follow through on their desires if they approved an exit. UK election result: Jeremy Corbyn faced a steeply uphill challenge to sell himself as a potential prime minister. Negotiations with the remaining 27 members of the EU are due to kick off in a little over a week. Even before Thursday's vote, May had faced long odds in delivering the successful exit she has promised. 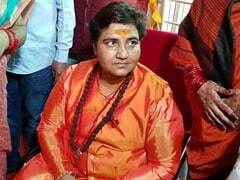 If she is still in office, her job has become even harder following the rejection of her plea for a broader mandate. May had vowed a hard break with the bloc that leaves Britain outside the single market, the customs union and the European Court of Justice. But she has also promised to deliver a free-trade deal that will preserve the best elements of membership without many of the onerous burdens. European leaders scoff at such a notion, and say that Britain's demands for EU benefits without responsibilities will have to be denied lest the country's departure trigger a rush to the exits by other nations demanding the same sweetheart deal. If she prevails, May also will be under pressure to deliver on pledges to expand the powers of police and other security services following three deadly terrorist attacks this spring, including two in the midst of the campaign. After the most recent attack - a van-and-knife rampage in London that left eight dead - May said "enough is enough" and promised a sweeping review of the nation's counterterrorism rules. Many observers thought the attacks would play to May's advantage. But Corbyn managed to flip one of his potential areas of weakness - security - to a strength by hitting out at May for the cuts to police budgets she had authorized as the nation's home secretary, the top domestic security official. He promised to put more cops back on the beat - a message that aligned with his broader mantra. "It's sort of like Labour offering a huge platter of beautiful juicy burgers and steak and fried food in front of voters. And the Tories are like, 'Think about the bill!' and the voters are like, 'We don't want cold radish again!' " said Rob Ford, a politics professor at the University of Manchester. "You can see why people find that appealing."